California’s largest and best-known fitness weekend, featuring something for every body! Now in its seventh year, attendees will find more competitions, demonstrations, seminars, and exhibits than ever before in the areas of MMA, bodybuilding, fitness, strongmen, power lifting, bench press, wrestling, Jiu-Jitsu, martial arts, and more! The 2010 Bodybuilding.com Los Angeles Fitness Expo™ presented by Gaspari Nutrition and Pro Fight Supplements, California’s largest health and fitness weekend, returns Saturday and Sunday, January 23-24 to the Los Angeles Convention Center, 1201 South Figueroa Street, South Halls G & H.
Attendees will find over 250 exhibits offering the latest in fitness, diet, nutrition, strength and wellness products and services. The Bodybuilding.com Los Angeles Fitness Expo also offers 10 major competitions, including two new events introduced this year. THE AAU USA WARRIORS CLASSIC WRESTLING CHAMPIONSHIP (Saturday) High school students will compete at The Bodybuilding.com Los Angeles Fitness Expo. THE LA OPEN MARTIAL ARTS COMPETITION This two-day event will feature the best in Karate and Sport Martial Arts Competition with extreme forms and weapons expertise. Expo attendees will also cheer on competitors participating in returning contests including The Gaspari Nutrition All American Strongman Challenge, The Scot Mendelson Pro Bench Press Classic, The Gracie US Nationals and Gracie Kids World Championships and The USPF American Cup Powerlifting Championship. Attendees can also get in on the contest action by participating in Champion Nutrition’s MAX REPS competition and the Bodybuilding.com’s BodySpace Spokesmodel Search where one lucky man and woman will grace the cover of Iron Man Magazine and represent Bodybuilding.com and the BodySpace community at the 2010 Arnold Expo in Columbus, Ohio and the 2010 Olympia Expo in Las Vegas, Nevada. The sport of MMA returns for the fifth year to Bodybuilding.com Los Angeles Fitness Expo with MMA athletes, pro training sessions, ring girl contests, and live remotes. Appearing this year will be MMA greats, Thiago Silva, Hector “Shango” Lombard, Jake Shields, and Bob “The Beast” Sapp. Want to learn self-defense? A special self-defense class (Sunday only) will be offered by Ryon and Ralek Gracie, of the legendary Jiu-Jitsu Family. Attendees will learn techniques that are simple and effective, even if they have never practiced any martial arts. Plus it is an amazing workout! Space is limited so participants are encouraged to come early. Adult admission tickets are $15 per day or $20 for the full weekend, children 12 years and under are $5 per day and children under six are free. Show hours are Saturday, 9:30 AM – 6:30 PM and Sunday, 10 AM – 5 PM. Plenty of parking is available. For more information on ticketing, exhibiting or sponsorship opportunities call (818) 545-0290 or visit http://www.thefitexpo.com. The Bodybuilding.com Los Angeles Fitness Expo is sponsored by: Gaspari Nutrition, Pro Fight Supplements, Champion Nutrition, Ford, Muscle & Fitness, Flex, Met-RX, Pure Protein,, EAS, Muscle Milk, BSN, Subway, GNC, PROPTA, Muscle Mag, Muscular Development, MMA Worldwide, , Oxygen, Iron Man Magazine, Powerlifting USA, IronMind, Home Gym.com, GetBig.com, Sherdog, Go Green Expo and Blackbelt Magazine. 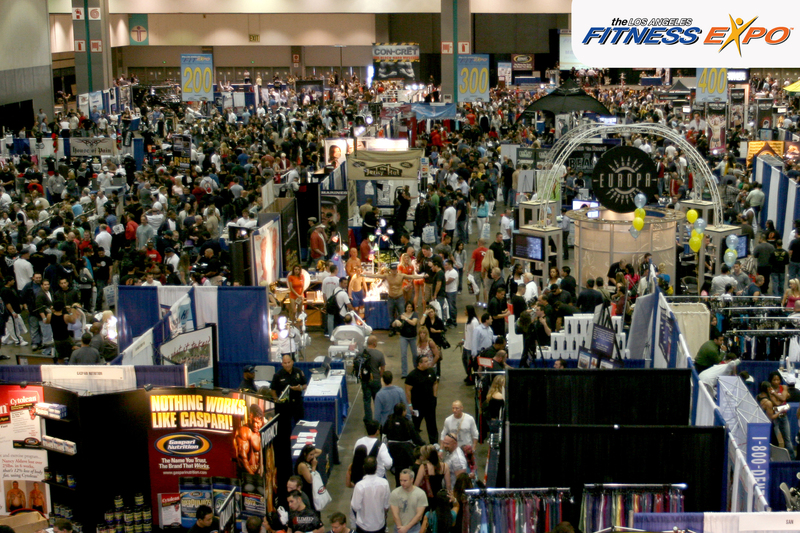 Start the New Year Right at the Bodybuilding.com Los Angeles Fitness Expo this Weekend at the Los Angeles Convention Center!California's Largest health and fitness weekend in California!